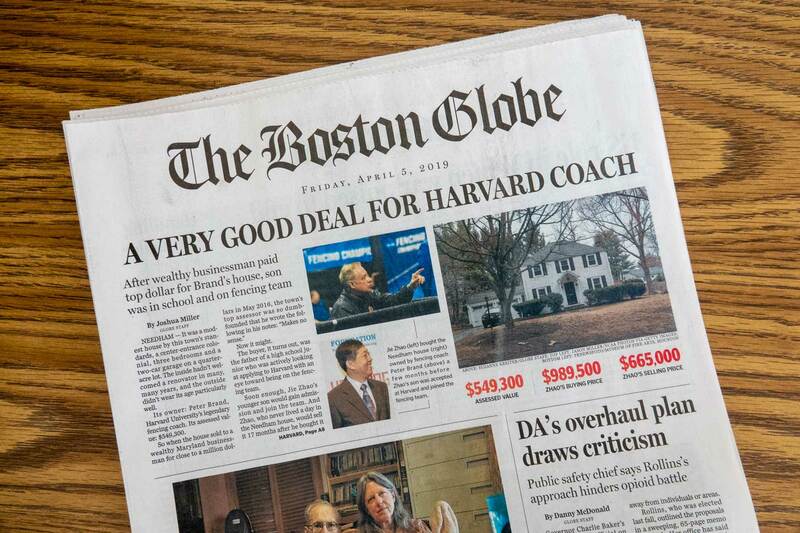 The front page of Friday morning’s Boston Globe reported—under the headline, “A Very Good Deal for Harvard Coach”—that Peter Brand, head coach of Harvard’s fencing team since 1999, had engaged in real-estate and non-profit financial transactions with the parent of a current and former College student. Specifically, Brand sold his Needham home in 2016 for more than $400,000 above its assessed value to the parent of a fencing recruit, then a junior in high school, who is now a sophomore at the College. Brand then reportedly purchased a condominium in Cambridge, offering more than $300,000 above the asking price. The inflated price of the home sale drew the attention of the Needham assessor at the time, and when the nationwide admissions scandal uncovered by the FBI was reported in March, a prospective buyer of the property, which was later sold at a loss of more than $300,000, brought the transaction to the attention of the newspaper. In an interview with the Globe, Jie Zhao, a Maryland businessman who is the father of the sophomore fencer, maintained that he was not attempting to influence Harvard’s admissions process. His son, an A student at St. Alban’s (as confirmed by the newspaper’s review of his transcript) with “near perfect SAT scores,” also had Harvard family connections: his older brother, also a fencer who graduated in the class of 2018, and his mother, who holds multiple Harvard degrees. “It’s a no-brainer, I don’t have to do anything,” Zhao told the paper. The news was also reported in The Washington Post, The Harvard Crimson, Inside Higher Ed, and The Chronicle of Higher Education. The news broke after this magazine’s May-June issue had gone to press. This is a developing story and will be updated.